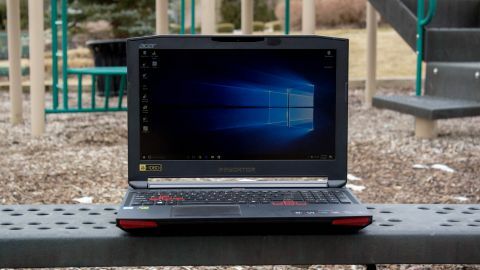 Acer’s Predator 15 falls short in battery life while being unbearably thick and heavy, but it packs inordinate amounts of cooling and some useful keyboard and trackpad features. Acer has taken quite a few risks over the past year between the uniquely designed reptilian of a desktop the Acer Predator G6 and the behemoth of a laptop known as the Acer Predator 21 X. As such, you might expect the similarly monikered Predator 15 to follow in the ambitious footsteps of Acer’s other gaming-centric machines. With that in mind, temper your expectations. The Acer Predator 15 is an earnest, honest-to-God attempt at a gaming laptop exactly as we know it. It features a handful of additives, such as macro keys and the why-don’t-all-laptops-do-this ability to power off the touchpad. Ultimately, though, it’s nothing more than a reasonably priced VR-ready gaming laptop with everything intact. That isn’t necessarily a bad thing, however, as behind the Acer Predator 15’s splashy chassis is a set of components adequately optimized for a full HD display. From the top-end Intel Core i7 processor to the Pascal-series Nvidia GeForce GTX 1060, everything about the components scream cutting-edge. The outside of the machine is a different story – but before we delve too far into design details, let’s take a look at how much the Acer Predator 15 costs in all its many forms. The Acer Predator 15 is sold in several configurations for a range of different prices. The newest model, which is limited to an Nvidia GeForce GTX 1060 graphics card, can be had for $1,379 (about £1,365, AU$2,210). In the UK, you can purchase Skylake models with either a GTX 1060 or 1070 for £1,499 or £1,699, respectively. As of this writing, neither version can be purchased in Australia. Meanwhile, Alienware 13 R3 is another compact option priced at $1,549 (£1,499, AU$2,399), granted the screen is two inches smaller and the memory is halved. The Acer Predator is not thin, nor is it light. Measuring in at 1.5 inches thick, it’s bulkier than two similarly specced Razer Blades stacked together. Bear in mind, however, that unlike Razer’s offering, it manages to pack in a full size 1TB hard drive in addition to 256GB of SSD storage. Even so, the 4.16-pound (1.88kg) Razer Blade, replete with its 0.7-inch girth, speaks for itself. The Acer Predator 15 boasts a design that’s entirely inconvenient. It’s awkward and clumsy to lug around, what with its ventilation system protruding from the rear. Given the short-lived battery, you’ll also need its weighty power brick wherever you go. This is a gaming laptop by definition in the oldest tradition.It’s unwieldy to the point of embarrassment and it’s by no means portable. Even compared to the Alienware 13 R3, which isn’t as fit as the Razer Blade, the Acer Predator 15 is still a hassle to carry around. Weighing just over 8 pounds (3.6kg), this is a laptop that clearly prioritizes performance over appearances. For better or for worse, everything about this machine is a gaming laptop to the core. From the RGB-backlit keyboard to the alarming “Predator” noise it makes whenever powered up, the Acer Predator 15 boasts an appearance that’s either garish or splashy depending on your tastes. There are a few features that particularly stand out on the Acer Predator 15. The membrane keyboard and trackpad both feel rather decent to the touch, but they’re nothing special. As such, if you want to disable the touchpad altogether and instead plug a mouse into one of the laptop’s many ports, you can do so at the touch of a button. It was clever for Acer to include not only a physical switch that deactivates the trackpad at will, but also a set of five macro keys that can be mapped to any action. We’re not just talking game controls here. Open up Acer’s PredatorSense software and by default, one of these macro keys is set to maximize fan speed while one disables sticky keys and another is simply a shortcut for the Win + D command, which minimizes all tasks and springs you immediately to your desktop screen. There’s also the disc tray, which can be swapped out for the included “Predator FrostCore” cooling mechanism. For those who don’t need an optical disc tray, it’s a handy alternative of inserting an additional cooler for when things get extra heated in your next round of Overwatch.